The VW Holiday Gift Guide is here. If you have a Volkswagen driver or enthusiast on your holiday gift list this year, Clarkdale Volkswagen has you covered. 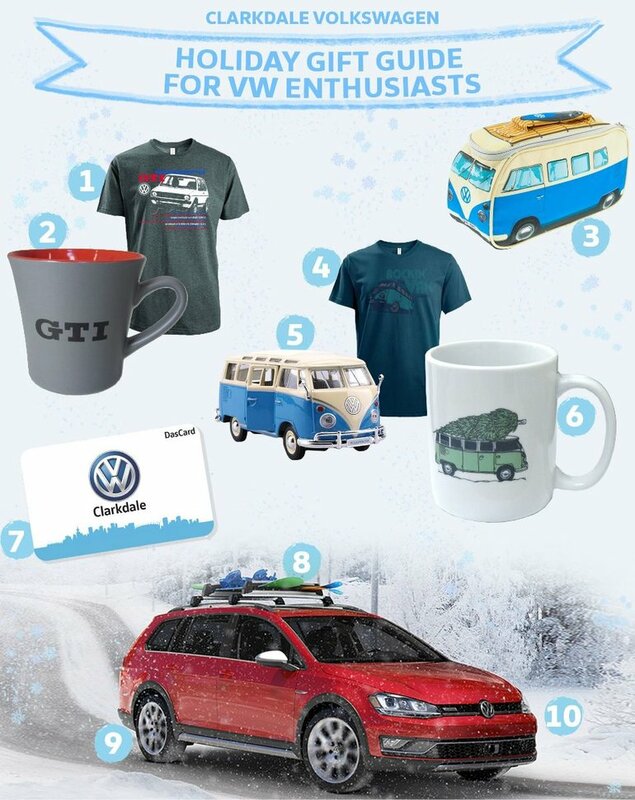 We’ve got tons of VW gifts to fit any budget. Check our website or come on by to see for yourself. Happy Holidays! Clarkdale Volkswagen’s DasCard. The perfect gift card for any VW driver or enthusiast. Pre-paid maintenance, cool VW accessories, detailing center or even a down payment towards a new VW, the DasCard can be put towards anything! Volkswagen Base Carrier from $366.10, and Snowboard/Ski Attachment from $207.03. Fits any VW model, just in time for winter adventures! 2017 VW Golf Alltrack. AJAC’s “Best New Large Car of 2017” award winner, the Alltrack is the ultimate gift for the whole family. Standard 4MOTION® All-Wheel Drive provides optimal traction and driving dynamics to you and yours anywhere you want to go this winter. Happy holidays from all of us at Clarkdale Volkswagen!